Former actress Asin Thottumkal and businessman Rahul Sharma are celebrating their second anniversary today. Asin delighted us with an adorable picture of her daughter, whom she welcomed in October, last year. 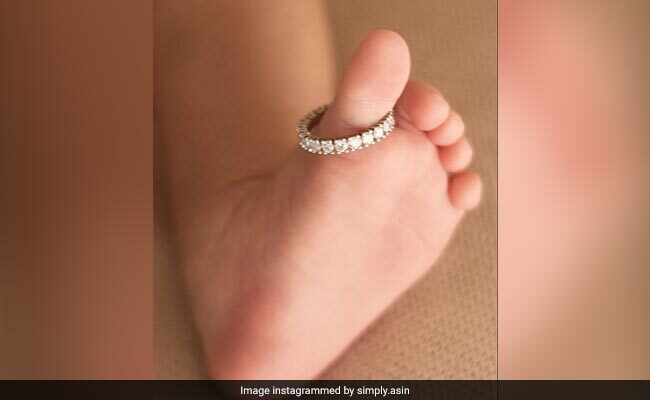 Asin's picture features the foot of the baby girl with Asin's wedding ring on her toe. Sharing the picture, doting mother Asin wrote: "#ARWedding #2years. It's the three of us now. Stepping into the third year. Couldn't have asked for more!" Fans have sent their love for Asin's daughter and wishes for the couple. Some users have also requested Asin to share pictures of her little daughter. "Wow thanks for posting such a cute pic on this special day....she is an angel...keep smiling you three ..always," wrote one user. Asin and Rahul got married in January, 2016 and the baby girl is the couple's first child. #ARWedding #2years It's the three of us now. Stepping into the third year. Couldn't have asked for more! Asin welcomed her daughter with a sweet post on social media. She wrote: "Ecstatic to announce the arrival of our Angelic Baby Girl earlier today. Thank you for all your love and wishes. She is the best birthday present I could ever ask for!" Earlier, actor Akshay Kumar had also shared a picture of himself with Asin and Rahul Sharma's daughter. He was seen cradling the baby in his arms, with a big smile on his face. "One joy which is completely unmatched... congratulations to my dearest friends Asin and Rahul Sharma on the arrival of their little angel," Akshay wrote. Akshay, who has co-starred with Asin in films such as Khiladi 786 and Housefull 2, had introduced her to Rahul Sharma, Micromax co-founder. Akshay served as the best man at their wedding and had also received the first invite. Asin, who earlier starred in Malyalam, Tamil and Telugu films, made her Bollywood debut in 2008 with Aamir Khan's Ghajini. She has starred in films like London Dreams, Ready and Bol Bachchan. 2015's All Is Well was her last film. Asin married Rahul Sharma on January 19, 2016 as per Hindu rituals and later, the couple had a church wedding, which was followed by a grand reception in Mumbai.